Map of the ports of Shimonoseki 下関 and Moji 門司, on the islands of Honshu 本州 and Kyushu 九州, respectively. The parts face each other across the swift current of the Kanmon Straights 関門海峡. “Moji Station”, per the 1914 map, is now known as “Mojiko Station”, now part of the “The Moji-ko Retro District”. 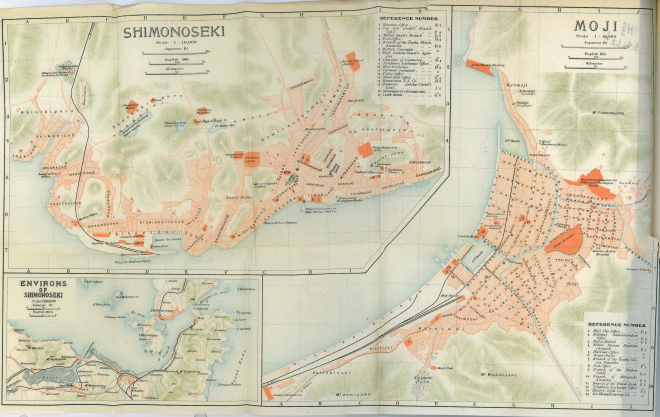 Shimonoseki Station appears roughly the same position, but today there is a great deal of reclaimed land south of the station that did not exist according to the 1914 map. You can actually walk from Kyushu to Honshu via an underground/underwater passageway, the Kanmon Pedestrian Tunnel 関門トンネル人道, which is 780 meters long, and costs 20 yen to cross. The halfway point, where you cross from one prefecture to the next, is clearly labeled at the lowest point of the tunnel.